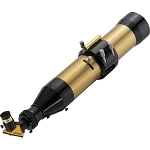 The Meade Instruments LX850-ACF 130mm f/7 Triplet APO Refractor Telescope System features a 130mm Series 6000 ED (Extra-low Dispersion) glass Triplet APO telescope with StarLock automatic guider and the LX850 German Equatorial Mount. 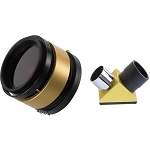 The OTA (Optical Tube Assembly) comes with a 5.1” (130mm) diameter fully multi-coated triplet objective lens made from ED glass for good contrast and sharpness, as well as near zero detectable chromatic aberration or color fringing. 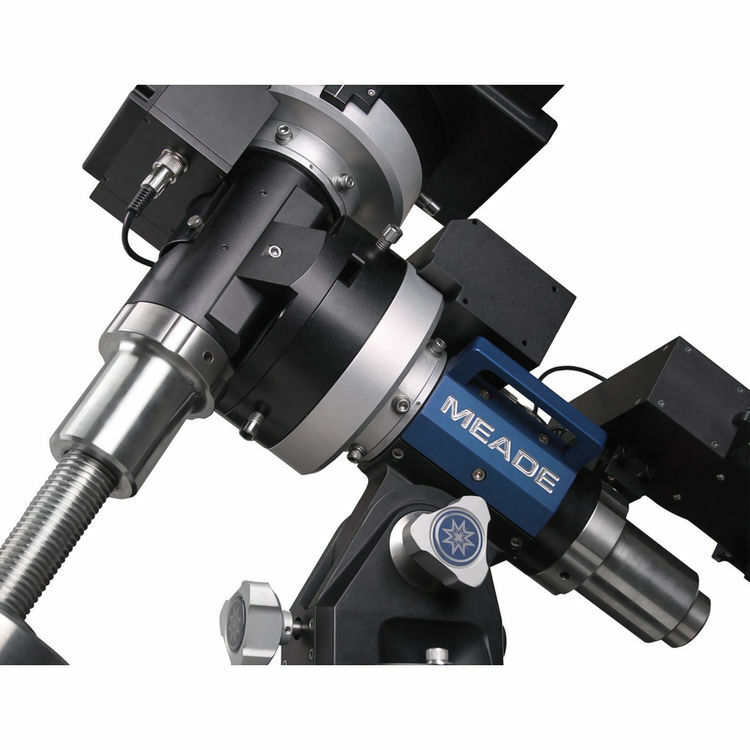 The OTA features a precise dual-speed 3" Crayford focuser with 10:1 gear reduction for fine focus control. The OTA has a focal length of 910mm, f/7. 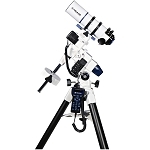 The telescope comes equipped with a Meade Series 5000 2" (5.08 cm) diagonal prism featuring 99% reflectivity, a Series 5000 HD-60 25mm eyepiece, and an 8 x 50 viewfinder with a quick-release bracket. 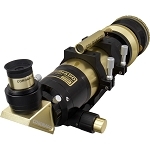 The system comes with a StarLock dual imager with an integrated full time guider, ultra precision pointing and assisted drift alignment, 5.8" (14.73cm) 225-tooth polished bronze worm/gear drives with low periodic error, internal cable routing, GPS receiver, AutoStar II GoTo system with over 144,000 object library, heavy-duty adjustable-height tripod with anti-vibration pads, 12V universal AC adapter, Meade zero image shift electronic micro-focuser, telescope to computer USB cable, and AutoStar Suite software. The StarLock autoguider makes target acquisition on your imaging sensor, and accurate guiding during exposures completely automatic. 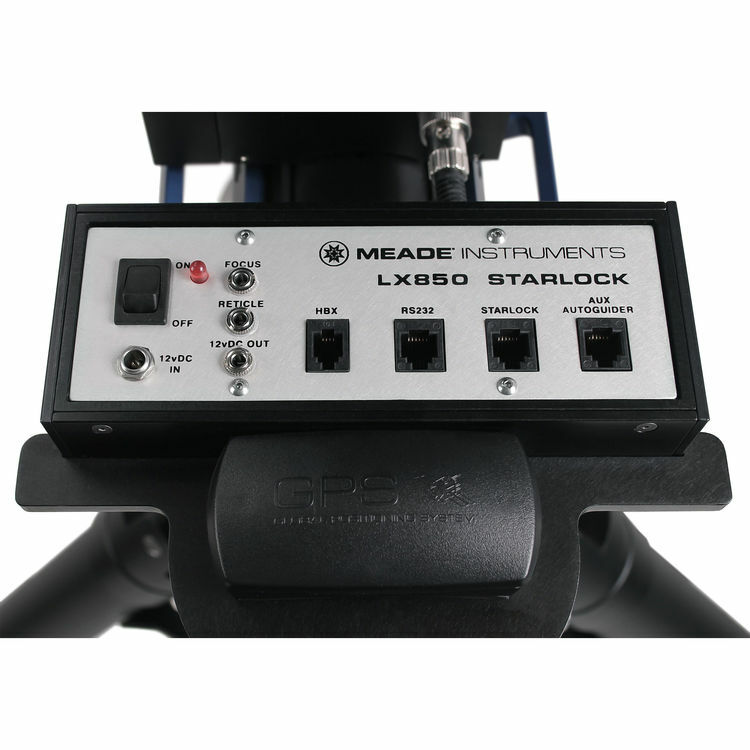 With Meade's LightSwitch technology at its core, StarLock uses an 80 mm f/5 optic and two camera sensor system to provide computer assisted polar alignment using the drift method. Once aligned the StarLock guides the mount in real time, and even automatically programs periodic error correction, achieving a guiding accuracy of up to 1 arcsecond in good seeing, and with the capability of guiding on stars as faint as 11th magnitude. StarLock requires no calibration, no user focusing or guide star selection. 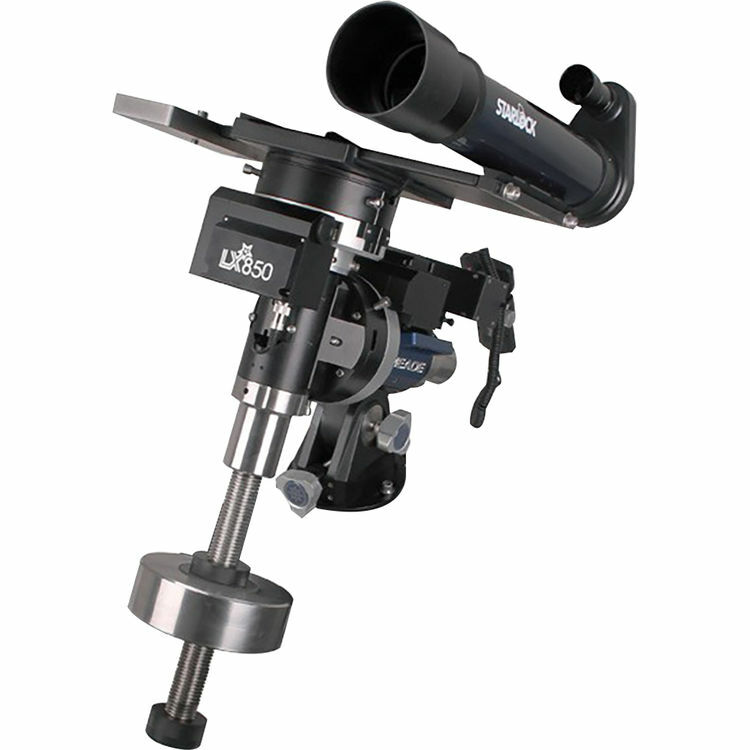 The LX850 mount, constructed of machined stainless steel and aircraft grade aluminum is a solid platform with a 90 lb (40.82 kg) payload capacity and pointing accuracy as good as 1 arcminute. Features include precision roller bearings on each axis, a 1.75” (4.44 cm) stainless steel RA shaft, 5.8" (14.73 cm) main gears, fine manual adjustment controls on both axis, and illuminated reticle output port. The mount’s main body weight is 55 lb (24.94 kg). The tripod’s height can vary from 29 to 45” (73.66 to 114.3 cm), and has 3" (7.62 cm) diameter stainless steel legs. The tripod weighs 36 lb (16.32 kg). The tripod comes with two 26 lb (11.79 kg) stainless steel counterweight. You can add additional counterweights (sold separately) to attach additional payload to the mount. The tripod features 3 anti-vibration pads to reduce vibrations and shorten damp-down time. 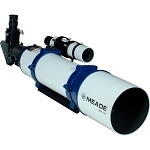 Note: The Meade LX850 Telescope is not meant to look at the Sun. Looking at or near the Sun will cause instant and irreversible damage to your eye. Eye damage is often painless, so there is no warning to the observer that damage has occurred until it is too late. Do not point the telescope at or near the Sun. 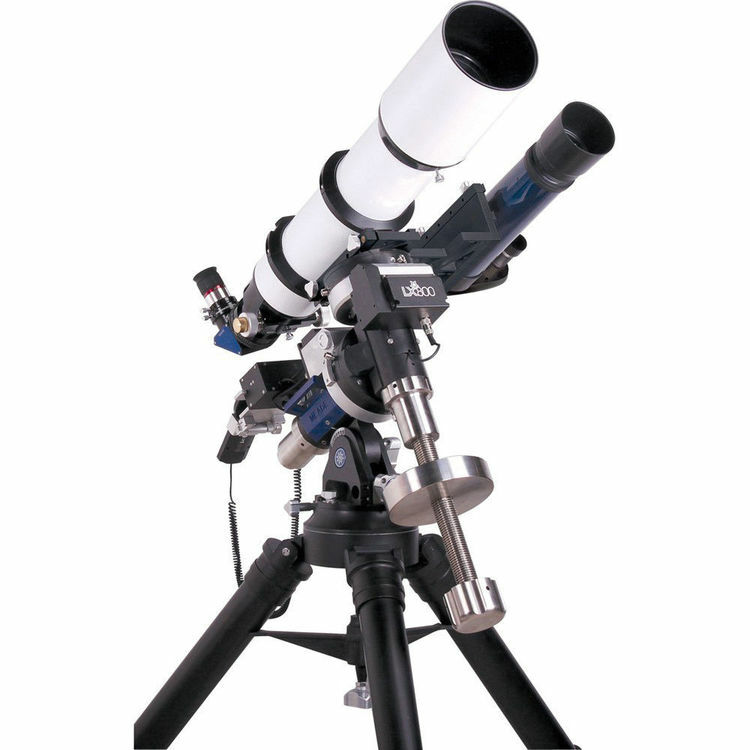 Do not look through the telescope or Finder Scope as it is moving. Box Dimensions (LxWxH) 48.0 x 37.0 x 33.0"